(Nanowerk News) Researchers in University of Cincinnati's Department of Cancer Biology are collaborating with material scientists from the University of Houston to create and use nanotubes to capture and understand the regulation of proteins involved in a variety of diseases including certain cancers, cardiovascular diseases and obesity. A recent study, published in the American Chemical Society Applied Materials & Interfaces journal ("Phosphopeptide Separation Using Radially Aligned Titania Nanotubes on Titanium Wire"), showed that titanium nanotubes grown on titanium-based metal wire provided efficacy for enrichment of phosphopeptides, the key regulation mechanism behind normal biological and cellular functions, and were easier to use, which could mean lower costs and more practical material use in scientific studies. 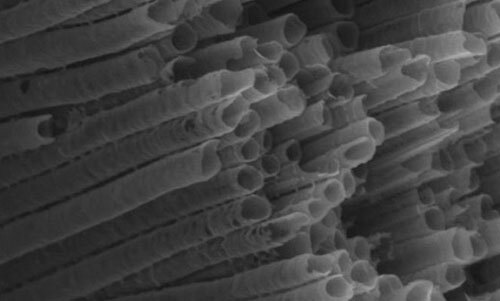 Scanning electron microscopy image of titania nanotubes. "Protein phosphorylation is a central regulatory mechanism for functions within the normal cells and biological processes in the body, while disruption of phosphorylation can lead to the initiation of a variety of diseases including cardiovascular, neurological, endocrine and cancer,” says Ken Greis, PhD, associate professor in the Department of Cancer Biology, member of both the UC Cancer Institute and the Cincinnati Cancer Center and co-author on the study. "Studies aimed at understanding the dynamics of phosphorylation have come to the forefront of biological research as the research community attempts to understand the underlying cellular mechanisms of disease with the goal of providing new targets for therapeutic intervention. Greis says the study of cellular phosphorylation of proteins (or phosphoproteomics) is typically done by separating and categorizing the proteins by liquid chromatography and mass spectrometry. Enrichment by adding metal materials is needed to help with this separation. Researchers used titanium wire based titania nanotubes and compared results when commercial particles were used on a set of known standard phosphopeptides and then on hundreds of phoshophopeptides derived from animal liver tissue. "Our studies revealed that the titania nanotubes on metal wire provide comparable efficacy for enrichment of phosphopeptides and easier use when compared to the particles. This could reduce costs and be a more effective method for future studies,” Greis says. "The ability to vary the length and the size of the nanotubes also opens the door to further development of the enrichment technology. This is truly an exciting collaboration which also highlights the benefit of scientific interactions across disciplines.